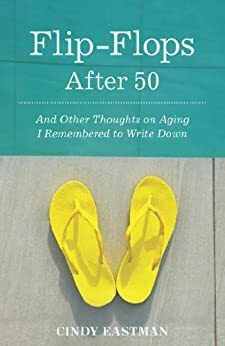 SUMMARY: Flip-Flops After 50 is a wry, witty collection of essays through which Cindy Eastman tackles the ups and downs of midlife. From her 30th high school reunion to her daughter’s wedding to running away to a cabin in Maine, she comes to terms with aging and change with insight and humor. The lens of humor does not make these essays less meaningful, however, as stories about the loss of an old friend, self-confidence and aging parents are included here. Flip-Flops After 50 is a wonderful opportunity to remember that we’re not alone in our advanced years and that many of us go through similar changes and challenges. Reading the essays is like spending time with a close friend in the celebrations of life as well as the transitions. THE BACK STORY: I’ve wanted to be a writer for as long as I can remember. I met that need throughout the years with various occupations (church secretary) and extracurricular activities (volunteering to write anything for everyone who knew I liked to write), but it wasn’t until over 15 years ago that I jumped on the blog bandwagon and finally had an outlet for my work. Soon after I joined the She Writes online writing community, they started a small press for women. I gathered up a bunch of my essays, edited them and submitted my manuscript. They accepted it! Finally publishing my book has been one of the greatest accomplishments I’ve achieved and it has given me confidence I never even anticipated. I recommend pursuing a dream, no matter how old you get. WHY THIS TITLE: After a certain age, priorities change and being comfortable in one’s footwear often rises to the top of the list. Wearing flip-flops is not only a fashion choice, but a mindset, giving freedom to choices and decisions based on personal comfort and convenience rather than following societal trends. WHY SOMEONE WOULD WANT TO READ IT: You will want to read it because it will make you smile. As we get older, we are handling things differently, hopefully better, but we still need that occasional affirmation that we’re on the right path. Other reasons are: It is a collection of short essays, so you can finish one or more while you’re waiting at the dentist or before you fall asleep. Also, it makes a great gift for people turning 50—it’s a no-brainer! AUTHOR PROFILE: Cindy Eastman is a writer and an educator; born in Bridgeport, Connecticut, she was raised in Louisville, Kentucky, made a brief sweep through Texas and is now back in New England. Her career has taken a wide and diverse route from teaching computer skills to elementary schoolchildren to teaching English as an adjunct to college freshmen at a community college, earning a Master’s degree in Education along the way. Eastman’s writing is informed by her ability to be an observer as well as a participant in her life. Starting at an early age, she kept journals to record her encounters – and make up stories – about the people, places and events that she experienced. The stories began to take a backseat to her observations, which became more and more fine-tuned as valid commentary on human behavior. With her dry sense of humor, she is able to address a variety of topical subjects and deliver an insightful analysis that’s both provocative and amusing. Eastman makes her home in Connecticut with her husband, Angelo and their cat. She is working on a second collection of essays when she is not babysitting her grandson. AUTHOR COMMENTS: Family emergencies for the last six months have kept me from working on my second book, so I am grateful to have this opportunity to share my first book with new readers. I love feedback (and reviews!) so please let me know what you think. Thank you, Darrell, for this wonderful place for authors and readers! SAMPLE CHAPTER: See Amazon page. LOCAL OUTLETS: Please check Indiebound to support your local bookstores. In Connecticut, Byrd’s Books in Bethel and Hickory Stick in Washington carry the book. It can be ordered from any local bookstore. If you’d like a personalized bookplate, email me the details and I’ll send you one! WHERE ELSE TO BUY IT: The usual online places…Amazon, Barnes & Noble carry it, too.